Do you have any ‘Smart accessories’ in your home? If you don’t now, you soon will! Smart accessories are appliances, lights, locks, thermostats, smart plugs, and other gadgets that can be automated to perform tasks from a central hub – in this case, your iOS device. All of these appliances and accessories are part of a technological trend called home automation or ‘the internet of things’. Apple HomeKit was announced in 2014, and is Apple’s way of streamlining home automation. It also established standards for how Apple-friendly smart home accessories should interact with your iOS device, Siri, and other smart home accessories. Since 2014, many well known manufacturers such as Philips, Schlage, and others are making their smart accessories HomeKit compatible. Items such as door locks, blinds, thermostats, and speakers are becoming compatible with HomeKit. Soon enough, you may find yourself purchasing ‘smart accessory’, and if it’s compatible with HomeKit, you will be able to control it from your iPhone, Apple Watch, iPad, Apple TV or Apple computer. 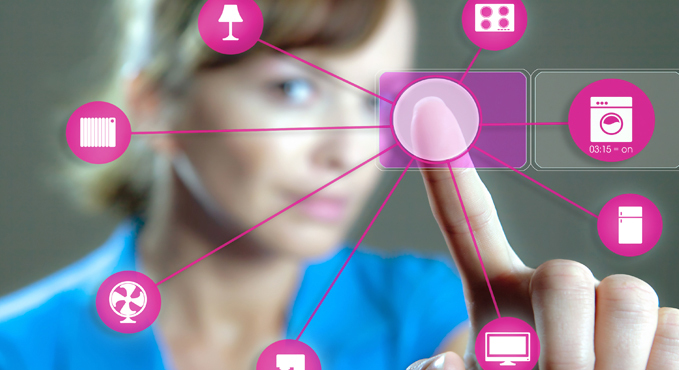 What does home automation mean for you? What benefits could it have in your day to day life? To start, home automation provides added safety for you and your family. If all of your appliances were connected to a central hub, you would never have to worry about the oven being left on – or your daughters curling iron. Automated door locks are a huge benefit of an automated home. Imagine the peace of mind provided by locks you can lock from anywhere. You’ll never have to wonder if your house sitter locked the back door! There are also money saving possibilities with the advent of automated lighting and heating systems. What Dad hasn’t dreamed of being able to turn off the lights when the kids leave them on? As the population ages, seniors will find the increased convenience provided by home automation to be very valuable. Imagine being able to program lights to turn on whenever you enter the home – and turn off when you leave. You could program the door to unlock every weekday at 11am when the caregiver arrives. Home automation technology will help seniors maintain their independence longer. Having more control over your living space and the ability to reach out in case of a medical emergency are huge benefits for seniors. Many people already own smart lights or a smart TV. These accessories come with their own app. And if you’ve been thinking about buying some smart locks, or even smart blinds, that’s where Apple HomeKit comes in. Without HomeKit, none of your accessories can communicate with each other. Wait, how can accessories communicate in the first place? What does that mean? Essentially, you are able to link different accessories together. Whereas before, you would go into each separate app to turn off your lights and shut your blinds, you can now create a ‘scene’ or group of actions. You could create a ‘goodnight’ scene for you lights and blinds.Just tell Siri ‘Goodnight’ and your lights will turn off, and your blinds will close. The possibilities with technology like this are endless. Especially when all of this can be controlled through voice commands and Siri. No confusing series of buttons to press, just a simple “Siri, turn off the lights in the living room”, and the lights are off. Every single accessory that has HomeKit enabled is compatible with Siri and can be controlled using nothing but your voice. In the fall of 2016 Apple is releasing ‘Home’. This app will eliminate the need for individual apps for every accessory. More on that later! What does HomeKit look like right now? While HomeKit accessories have been available for nearly a year now, there are still issues with connection and setup that might prevent one from completely outfitting their home with HomeKit accessories. Home automation as a general trend is growing though, and Apple’s HomeKit software shows a great deal of promise. If you are interested in trying out HomeKit – either for the convenience or as something of a hobby – you can get set up for under $50 by visiting your local Apple Store or home improvement store. This technology is fascinating, so let’s dig in to how it works. How can you get started with HomeKit? Many manufacturers are making their products HomeKit compatible. So your first step should be buying HomeKit enabled device! When HomeKit was first announced in 2014, many well-known manufacturers such as iHome, Haier, iDevices, Philips, Kwikset, and Belkin were already partners. Lutron: Lutron has released the Caseta Wireless system that allows you to tell your phone to “turn off the lights”. It is available for $229 at Apple Stores. More info HERE. Ecobee: This is an intelligent thermostat with HomeKit compatibility. It launched in June 2015 and costs $249. More info HERE. First Alert: The first and only smoke detector to work with HomeKit comes from First Alert. More info HERE. iHome: Connect ordinary devices (such as an electric kettle) into the smart plug, and you can control them with your phone. More info HERE. All devices with HomeKit integration have the “Works with Apple HomeKit” badge. Any product released prior to June 2015 will not work with Apple HomeKit. The only way to use products made prior to June 2015 is by using the iHome smart plug or Insteon Hub to control them through the iHome/Insteon app. For a fairly complete list of HomeKit compatible devices, go HERE. In fall 2016, Apple is coming out with ‘Home’ app. The long awaited app will centralize the control of all HomeKit devices. If you have an iPad, iPhone, or iPod touch running iOS 8.1 or later you can use HomeKit. You’ll need a HomeKit integrated device. On your iPhone, iPad or iPod, open the App Store, then download the HomeKit compatible app for your smart accessory. In your Settings, click on Bluetooth. From here, you can pair your device with your iOS device. Your accessory comes with a HomeKit setup code. Open your device’s app, and enter/scan the code. As soon as you have paired your accessory with your iOS device, you can begin using Siri commands such as “turn off the lights”. Once you’ve set up ‘scenes’ or groups you can speak something like “good morning”, which will open your blinds and boil water for coffee automatically. Or do any number of automated tasks. Once the Home app is released, creating groups will become much easier. Without the Home app, you must create the groups through each individual app. With HomeKit, everything must have an individual name. Each room must be named differently. Each house or location you have accessories in must be named differently. Each accessory must have a different name. Generally, your HomeKit compatible device will name itself for you. E.g Blinds, Coffee Maker, etc. Within the individual app, you can set up groups. This way you can turn off all the lights in your house with one voice command or touch. You can also set up ‘scenes’. So if you have your Apple TV, your lights, and your speakers all connected to HomeKit, you can create a “Movie Night” scene with dim lights, loud speakers, and the TV on. Then all you have to say to Siri is “Movie Night”. Another scene to set up is a ‘Good Morning’ scene – you could assign your lights, blinds, and thermostat to the “Good Morning” scene. Then, when you say “Good Morning” to Siri, your lights turn on, your heat or a/c is turned on, and your blinds open. Cool! For more in depth details on setting up scenes and groups, read your smart accessory’s manual. Every app is slightly different. Within the individual apps, you can program certain devices or groups to perform an action. The ‘trigger’ could be a certain time, but it could also be a proximity trigger based on where you are. For example, you can have your bathroom heater go on at 6am every morning, if it’s a HomeKit compatible accessory. Check out your accessory’s manual for further instructions. Siri can harness HomeKit enabled accessories to create a mood for a dinner party. This could means dimming the lights, turning on the air conditioning, opening the blinds, etc. With a HomeKit enabled deadbolt, Siri could lock the front door from anywhere. If you have more than one house with HomeKit enabled accessories, you can control those accessories by saying the name of the home you wish to control. If you have HomeKit enabled lights, Siri has full control over them. Turn them on, turn them off, change the colour, etc. The more you use Siri, the more you’ll realize how much it can do for you and how helpful it can be in your day to day life. With an Apple TV (3rd gen or later), you can use Siri commands to control your accessories when you’re away from home. To activate this feature, sign in to iCloud with the same Apple ID on your iOS device and Apple TV. You may have already done this! Occasionally, this feature may not work. If this is the case, simply sign out of your iCloud on your Apple TV. Then, with the same Apple ID you use on your other iOS device. This usually fixes the problem. If you have more than one person using your smart accessories, you’ll want to share control with your housemates. Whether it’s your family, spouse, or roommate sharing control is easy! The other people using the accessories need to be signed in to iCloud. Then, within the individual app for the accessory, you simply send the other person an invitation. If you were the first to set up the accessory, you will be the administrator. People you invite are shared users. All HomeKit accessories ship with a companion iOS app. Beyond using Siri, you can use these apps to control your HomeKit accessories. Most HomeKit apps can be used to control many different HomeKit accessories. This was part of Apple’s reason for rolling out a standardized way to configure HomeKit accessories. This means that if you have the Phillips Hue Lighting pack and the Schlage sense lock, you can control the lighting from the lock app, and vice versa. This is the case for most accessories and apps. Using a bunch of individual apps for individual accessories can be tedious, so just pick your favourite and use that. When the Apple Home app comes out, this will be the beautiful, centralized hub for all HomeKit accessories. That being said, some apps for individual accessories have specific functions that you may want to use. For example, setting up triggers for an individual accessory. For this reason, you’ll probably have to continue using individual apps – at least until ‘Home’ comes out. The ‘Home’ app is a very new addition to the HomeKit arsenal. It was only announced in June 2016 and it serves as the single destination for your smart accessories. Home will be a single app with every control function you need for smart accessories like locks, blinds, lights, thermostats, and other connected devices. Creating groups or scenes will be easy. Every scene will be easily accessible right on the landing page of the app. Home will be built into the Control Centre which will make it very easy to use. If you’re controlling your locks from your phone, you’ll want to be sure that no one else can control them! Apple want to set your mind at ease, so they have made HomeKit capable of enforcing complete encryption of all your data. No one will be able to break in and steal your data or change your home automation. When you register your HomeKit device using the 8 digit code HomeKit code, a security key is exchanged and encrypted. This will insure that all communication between your iPhone, iPad, or iPod and the HomeKit device is secure. Similarly, when a new user begins using the HomeKit accessory, all communication is encrypted and exchanged in the same way. All the keys and passwords are stored in Apple’s Keychain. These keys and passwords are not included in unencrypted backups. They will only be included in encrypted backups. Even using Siri voice commands, only the bare minimum of information is used. The name of your accessories, names of users, scene names, etc. is shared on a limited basis with Siri. Furthermore, if your iOS device is lost or stolen, you can use the Find My iPhone app to lock your device. You can also change your Apple ID to prevent anyone from using your HomeKit devices. Apple has further details about HomeKit’s security on pages 22-24 of Apple’s iOS security guide. Click HERE for guide. After all this information you may be wondering where to start! There are some Apple HomeKit compatible products out there that work really well and are worth looking into. Philips Hue Lighting Bridge 2.0: Have you ever wanted blue lighting in the basement but red lighting in your bedroom? Maybe not, but now that I’ve told you it’s possible, you’re at least thinking about it! You can also choose different types of white light if you’re feeling conventional, and automate when they turn on and off. The starter pack containing three bulbs, the bridge, and the software can be purchased for $59.99. More info HERE. Hunter Symphony Ceiling Fans: You can now automate your ceiling fans with the WiFi enabled Hunter Symphony Ceiling Fans. The possibilities become more interesting when you consider setting up ‘scenes’ wherein lights and fans work together as you wake up or go to bed. Starting at $329, Hunter fans can be purchased from their website. More info HERE. Honeywell Lyric Smart Thermostat: Honeywell’s Smart Thermostat is a very interesting development in smart home automation. The HomeKit compatible thermostat allows you to set temperature from your iOS device, automate when it turns on and off, and even ‘cooler’; sets up geofencing so the thermostat knows when you’re in the house. All of these functions can be grouped together in scenes with, say… the Hunter Ceiling Fan and Lutron lighting system. This thermostat sells for $249 on Honeywell’s website. More info HERE. Lutron Serena Window Blinds: HomeKit compatible smart blinds. These wireless blinds can be controlled via Siri from your iOS device. They’re available in many different shades and textures to match the aesthetic of your home. If you have all four of these items you have a pretty well set up ‘Good Morning’ scene in which your lights, thermostat, fan, and blinds all start working in sequence. Lutron claims the battery in the shades will last for five years. The blinds come in at around $400. More info HERE. Each link will take you to a review of the product. These can be purchased at Amazon, Apple Store, Best Buy, Lowes, and online. If you’re one of the early adopters of HomeKit and home automation, you may want to check out the growing home automation community. Automate your home – one step at a time! As our appliances and home become more connected, a streamlined way of controlling everything becomes essential. Apple’s HomeKit puts this ability right in the palm of your hand. Securely controlling your household items on the same device you already use everyday!